Weymouth (125) Lowestoft (375) RV Endeavour Smarter Marine Monitoring from Space Rodney Forster, Cefas 1- Current uses in monitoring, operations and forecasting. 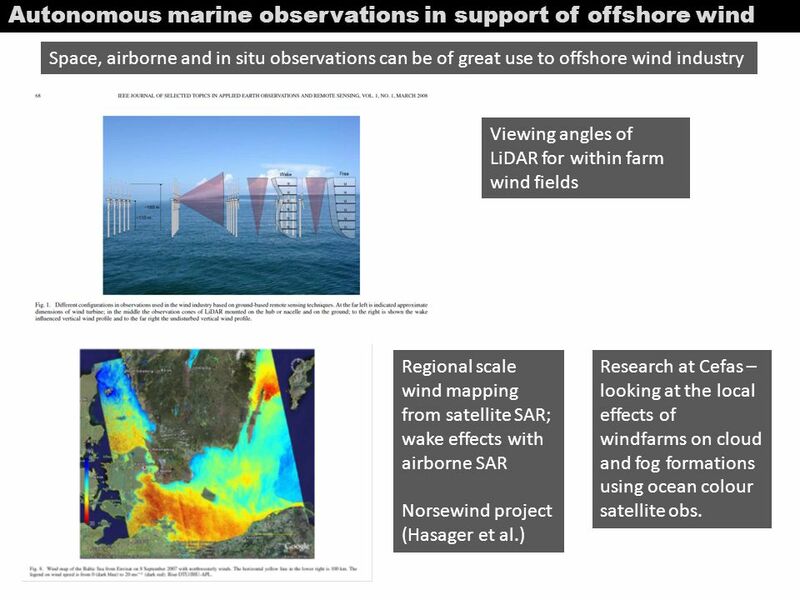 6 Autonomous marine observations in support of offshore wind Space, airborne and in situ observations can be of great use to offshore wind industry Viewing angles of LiDAR for within farm wind fields Regional scale wind mapping from satellite SAR; wake effects with airborne SAR Norsewind project (Hasager et al.) 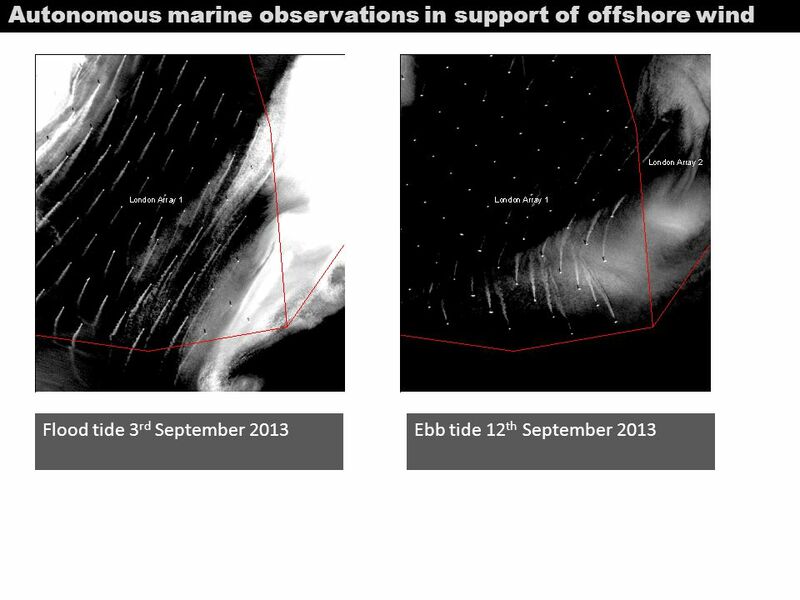 Research at Cefas – looking at the local effects of windfarms on cloud and fog formations using ocean colour satellite obs. 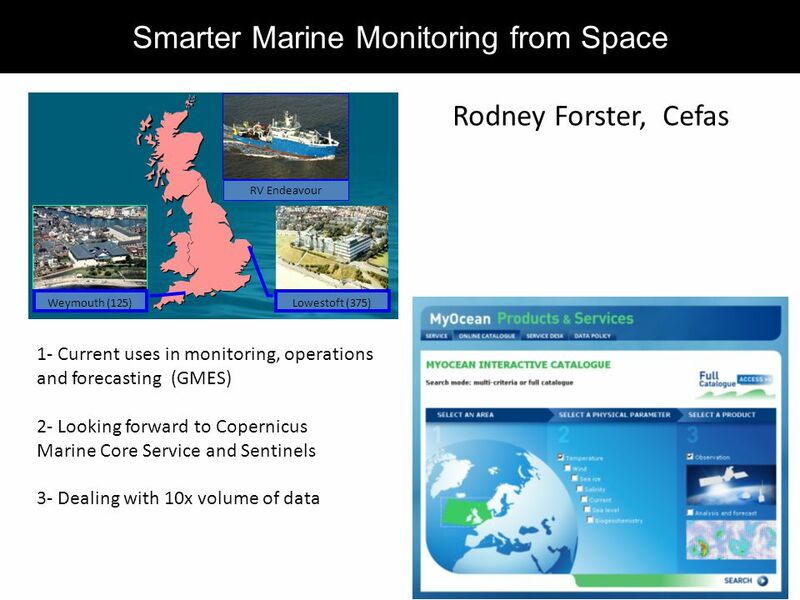 Download ppt "Weymouth (125) Lowestoft (375) RV Endeavour Smarter Marine Monitoring from Space Rodney Forster, Cefas 1- Current uses in monitoring, operations and forecasting." 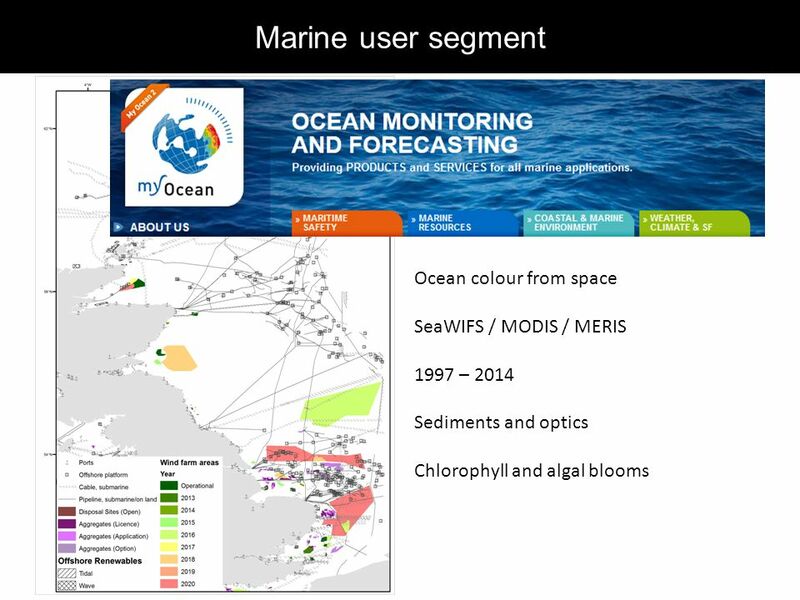 DEVELOPING A EUROPEAN OCEAN COLOUR SERVICE SUPPORTING WATER QUALITY ASSESSMENT AND OPERATIONAL OCEANOGRAPHY Antoine Mangin1, Samantha Lavender2, Odile. 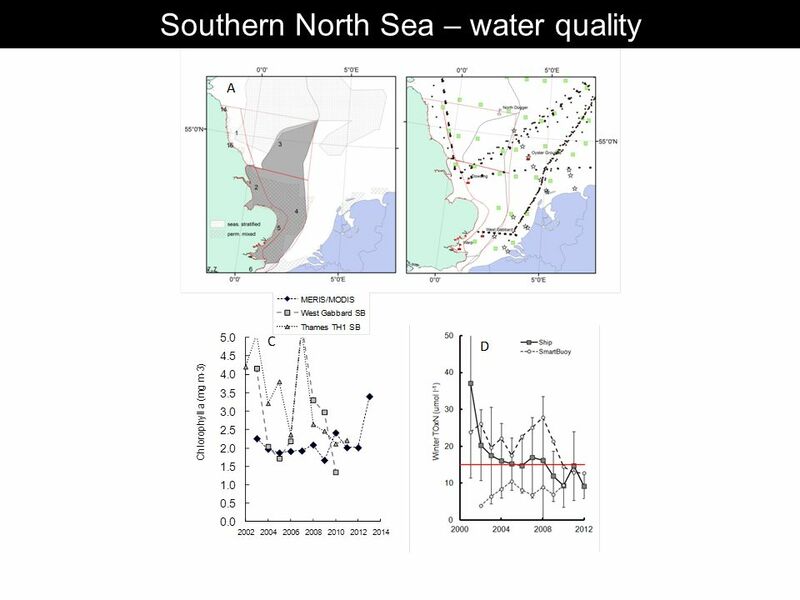 The development and generation of the long term Mediterranean SSR products Rosalia Santoleri, Gianluca Volpe, Cristina Tronconi, Roberto Sciarra Istituto. GMES Marine Service MY OCEAN 5th GEO European projects Workshop Frédéric ADRAGNA MyOcean Project Manager London – 8/9 February 2011. Lisl Robertson, University of Cape Town, RSA with assistance from Stewart Bernard Christo Whittle GOOS AFRICA. Towards establishing the GlobCOLOUR Service within the GMES Marine Core services Globcolour / Medspiration user consultation, Dec 4-6, 2006, Villefranche/mer. Marine Core Service MY OCEAN The GMES MyOcean Marine Service Bertil Håkansson SMHI, Core Service MyOcean Core User Requirements. Remote Sensing Solutions. Story Turnover : 2 Millions euro Personnel: 15 persons Flyby is an independent private Italian SME company funded in Mission. ECOOP Meeting March 14-21, 2005 ECOOP WP7 Pierre-Yves LE TRAON Better use of remote sensing and in-situ observing systems for coastal/regional seas Objective. 1 SWALIM Workshop, Nairobi June 2007 N. Hoepffner, M.Clerici, and S. Djavidnia* Global Environment Monitoring Unit EC-JRC, Ispra The African Marine. REMOTE SENSING OF SOUTHERN OCEAN AIR-SEA CO 2 FLUXES A.J. Vander Woude Pete Strutton and Burke Hales. Lesson 12: Technology I Technology matters Most of the topics we’ve learned so far rely on measurement and observation: – Ocean acidification – Salinity. 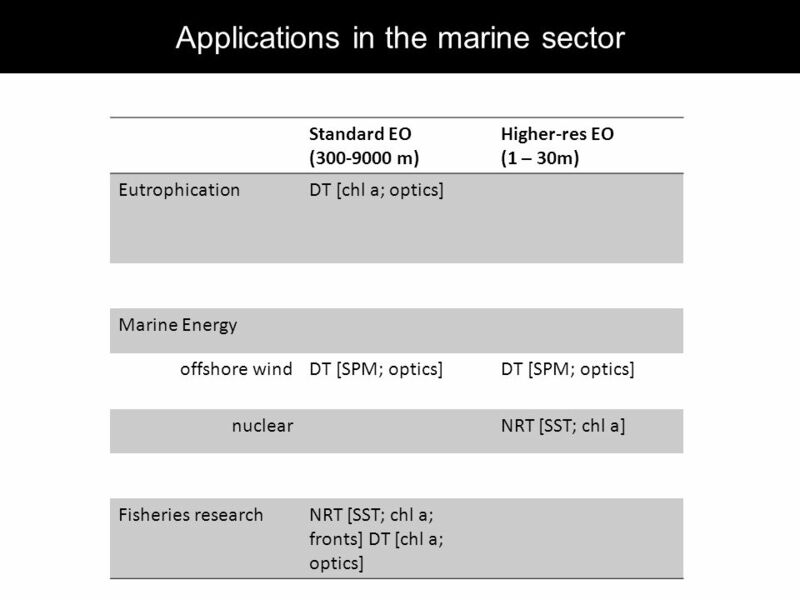 EMECO – European Marine Ecosystem Observatory UK – Cefas, EA, NOC, SAHFOS; NL- Rijkswaterstaat, Deltares, NIOZ, Norway-IMR, NERSC, Met Off; DE-GKSS, BE. 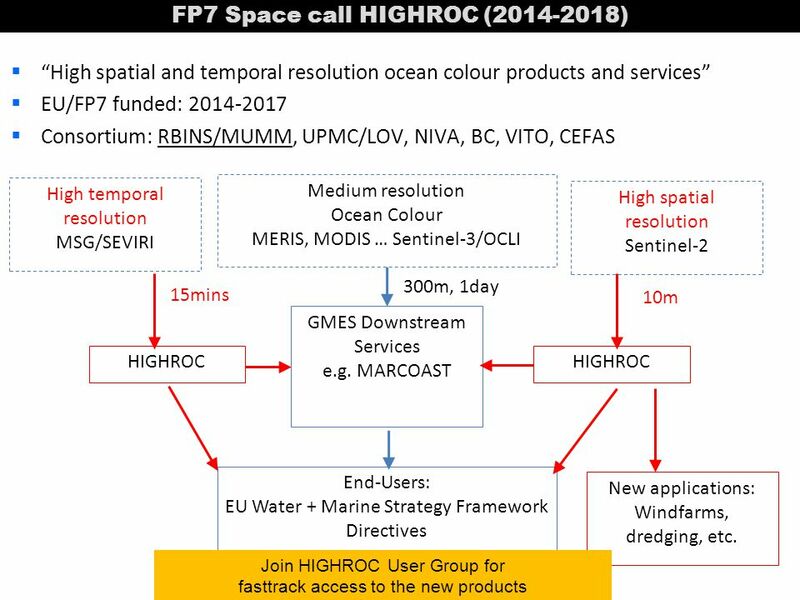 Participants: CNR-ISAC Ifremer JRC-EC European COastal-shelf sea OPerational Observing and forecasting system Integrated Project WP3: “Better use of remote. 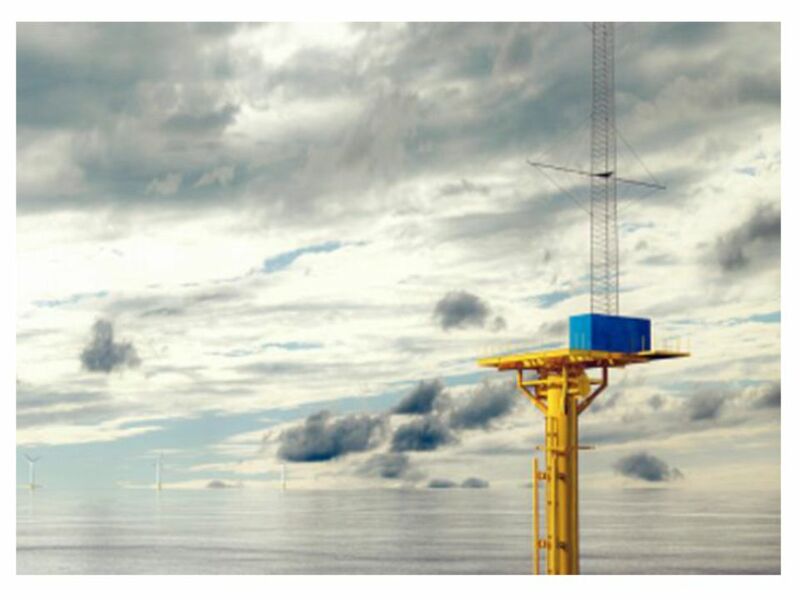 AVHRR, SeaWiFS The NRT satellite observing system for the Adriatic sea The satellite OC observing system ADRICOSM experience In the framework of ADRICOSM. 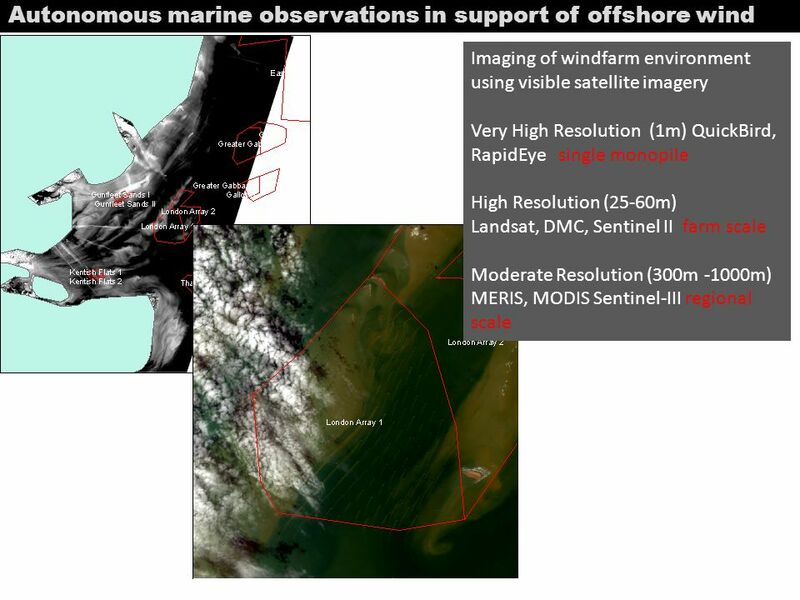 Remote Sensing at RSMAS – a new NESDIS connection Peter J. Minnett Meteorology and Physical Oceanography Rosenstiel School of Marine and Atmospheric Science. 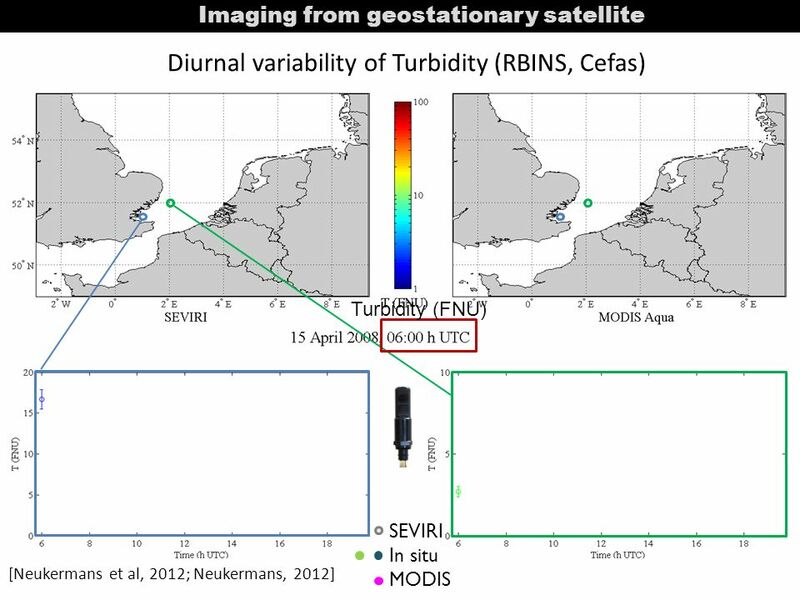 Satellite Capabilities for Water Resource/Quality Mapping 27 May 2013 Mark Kapfer C-Core 1. Ecology, Climate, Physical Oceanography. Bering Sea, Alaska SeaWifs Image (Norman Kuring image, NASA, April 25, 1998) Turquoise = phytoplankton bloom. 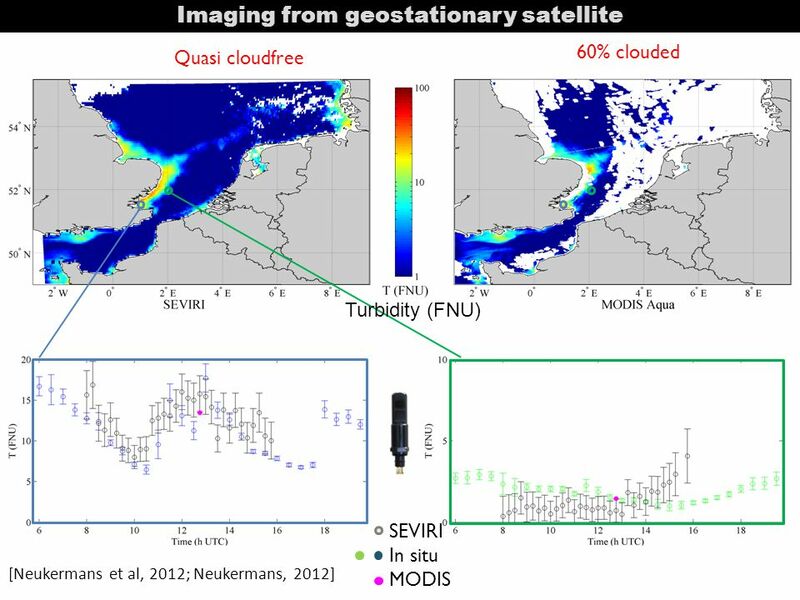 Optical in situ and geostationary satellite-borne observations of suspended particles in coastal waters Griet Neukermans 1,2 Promoter: Hubert Loisel 2. 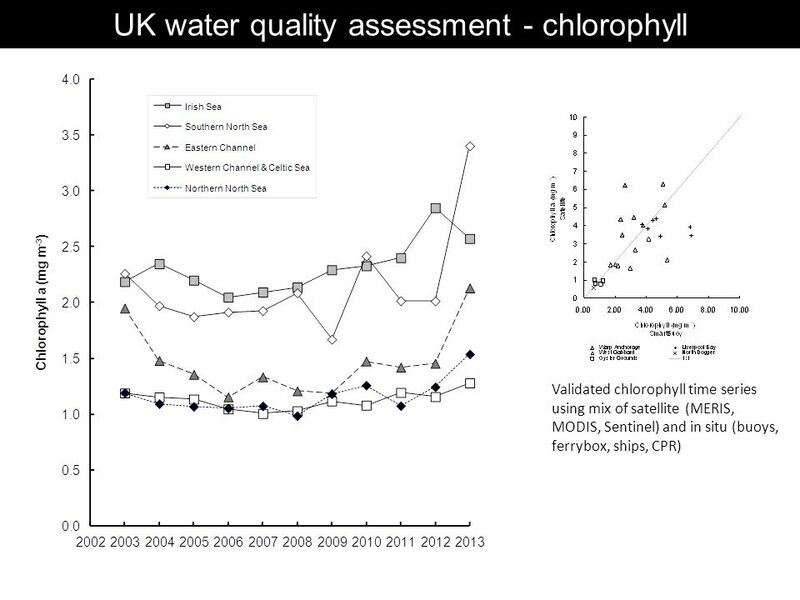 Jon Rees – Cefas Marine Observations.